I use mouse and keyboard task automation software very rarely (I remember to have used TinyTask several times) so I am far from being an expert in the area. Some time ago I came upon a new program- Niatask, which I found promising so I decided to share my discovery with the community. Create a Project that holds multiple Input Scripts. Use the app to Record Mouse and Keyboard activity in real-time which then generates a script file then adds it to a Project. You can then assign specific Hotkeys for each script which will Play the needed script. input to fire a script. values along with the applications Global Settings. You can export (save as) specific scripts and import them to the project also. 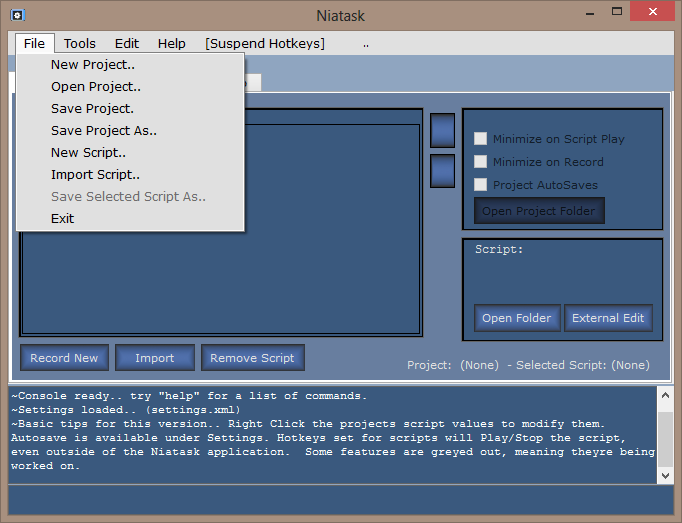 Scripts are lines of text the application translates into automation. 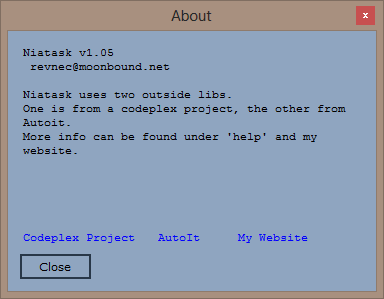 Niatask (as of version 1.050) is portable by design- settings are saved in XML file (settings.xml) inside program folder. Niatask should run on Windows XP or higher. 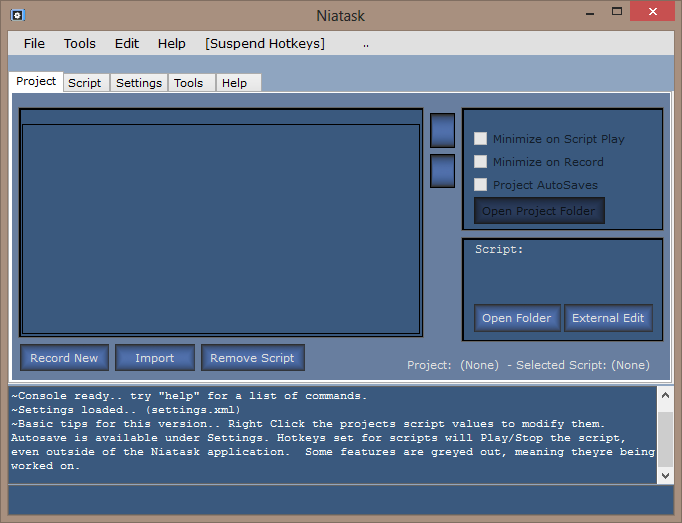 Niatask is closed-source, unrestricted freeware, the license type is not specified. The developer can be contacted via mail, he also accept donations. 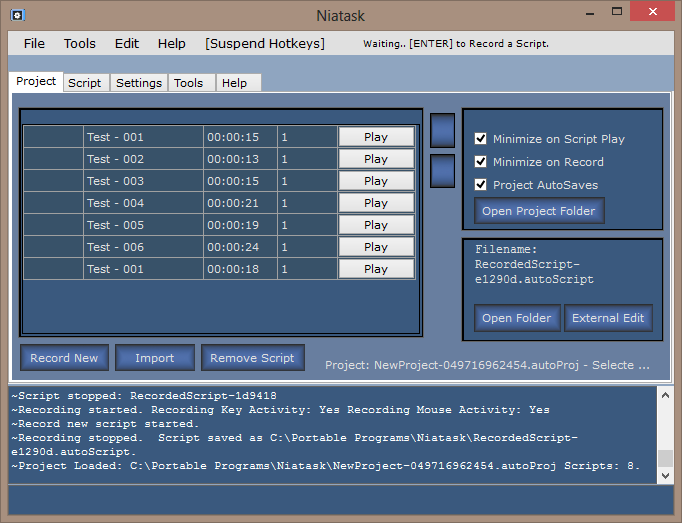 Niatask is small- 4.55 MB uncompressed. Niatask is relatively slim on system resources- on my system (Windows 8 x64) it uses about 32 MB of RAM. Niatask crashed on a couple of occasions while I was testing it. Interesting program. Recording keystrokes is much easier this way than doing it manually via AutoHotkey or other half-automated tools. Yet another amazingly thorough review. I've been struggling to automate some basic, repetitive desktop operations so I'll definitely be testing this out. I was a little frustrated in initial testing that that it doesn't seem to function on multiple monitors (I almost always have multiple monitors setup), but the mouse control/movement was much better and more accurate than other tools I've tested. I'll keep working with it.